You can't be at your business all the time, because of that, you look for solutions that will let you know when something is happening so that you can address it. Many business owners and managers turn to security camera systems for this purpose, shopping for a system that will send text or email alerts to them. Most systems these days will list text or email alerts in their features, and when asked, the salesperson will say "yes we can send text alerts when someone approaches the business". However, when it comes to reality, once installed, most business owners turn off these alerts promptly. These alerts are often not used, because of the fact that they don't live up to the hype. These alerts are usually based on video motion. This means that the video is compared frame by frame, and if pixels have changed in the video, it will send an alert. Most of these type of alerts do not allow for you to define just a certain area of the video, with the exception of eliminating all motion detection in those areas. This means that not only will you not get alerts in the masked areas, but also the system will not record. By nature, these systems use the same motion detection sensitivity, masking and algorythms to sense motion for recording that they do to send alerts. This makes these alerts extremely limited and useless to business owners and managers. Even if the system was able to set a specific zone just for the motion alerts, when based on simple pixel change like standard motion detection, events such as rain, lightning, headlights from a car dancing across the screen or even bugs flying by the camera will cause a false alert (usually repeatedly every night). So in order to properly trigger an alert through a business security camera system, we have to not only completely isolate the detection of motion, but determine a better method altogether that will only trigger based on motion events for which you wish to be alerted. As all of these desired alerts are driven by the movement of people or vehicles, a successful system would best be able to determine regular motion from a person or vehicle, then send alerts only when one of those objects enter specific zones. 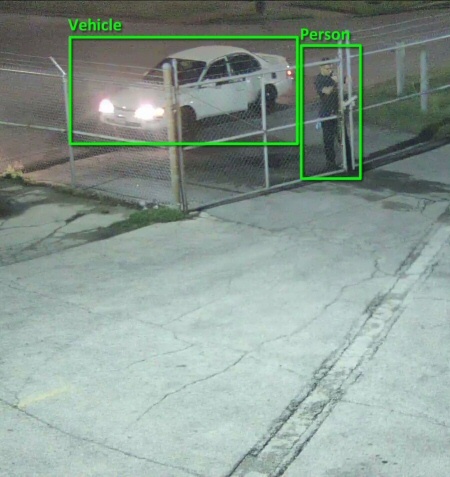 Luckily, there is a functional system that can accomplish both of those goals, and will operate completely independently of the motion detection that determines recording. This way, the system will still record even if there are small motions which may contain video that you want to see on playback, but only send alerts when specific objects enter certain defined zones. Our new SMART HD IP cameras will provide you with the answer. These cameras calculate the size, shape and speed of an object based on mathematical computations, to deliver the capability to isolate important motion events from motion events that are not important enough. Each object is tracked on the screen, and the cameras provide the computing power and programming to analyse each of the objects. Zones can be outlined on the screen as important areas, to define zones for alerting. These intelligent cameras need to be combined with an NVR recorder that is capable of scheduling the alerts at needed times. 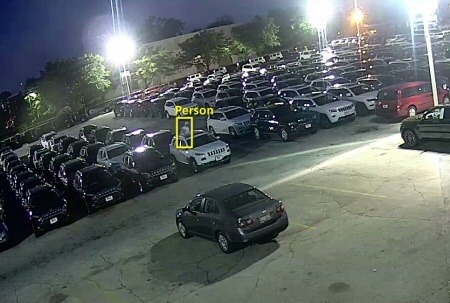 While the SMART security cameras deliver excellent capability for setting up events when specific actions occur, but the NVR recorder is what will process that information to deliver the text or email alert. The scheduler in our AVM (Advanced Video management) system allows you to predetermine times of day, days of the week, or even only trigger alerts when certain inputs are active (such as when the main alarm system is armed). 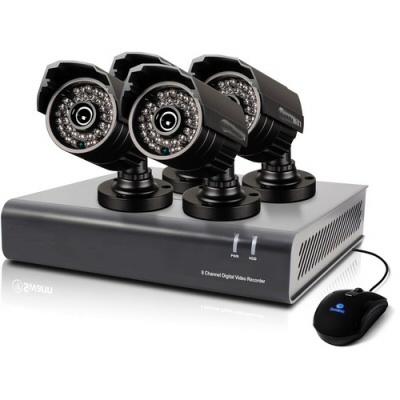 When searching for a security camera system for your business, if you plan to get alerts from the system, it is critical to find out what it is that is triggering the alerts. If based on normal video motion comparison, then they will not be effective alerts; however, if the alerts are triggered by a SMART camera then the alerts will actually be useful. Find a SMART Camera to deliver business alerts, and an NVR system that will process the inputs properly to send the alerts, like our Business AVM systems. Right On! This is exactly the problem I have been having. A "Professional" came and installed my system and claimed we could get alerts. But I just keep getting text messages constantly. I had to shut the system off completely until he could come back and show me how to turn off the text alerts. Guess I got swindled, or that guy just didn't know what he was doing. Gotta pay off the old system first, but I will be switching over soon. Thank you so much for this detailed breakdown. I have been looking for a system that will do this. Nice to know not just why it works, but why other systems don't.